"Using air pistols at Ham Rifle Club - Michael Facey 34". 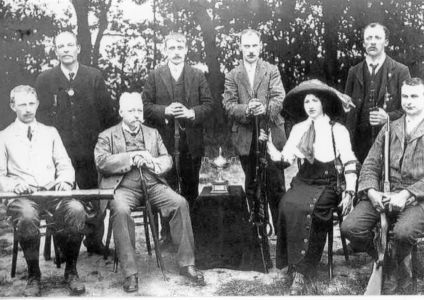 The early years of the 20th century saw much activity on the part of Field Marshall Lord Roberts to establish a rifle club movement. The Club, built between what is now Riverside Drive and Ham Fields, opened in May 1906 with a Garden Party. During the1st World War it was used for army training and more than 24,000 recruits took their first course in firing there. It is still a thriving club with regular guest mornings.